The Pony Woodworker's Vise is for medium duty home, shop or professional use. It is designed to mount to the face of wood work benches. The top edges of the jaws are typically brought flush with the bench top. It will mount to the face of any wood work bench but some work benches may need to be modified by mortising out part of the bench face or adding wood shims to allow jaws to be flush with the bench top. The jaws have drilled holes for attachment of wood facings which allows you to protect your work (wood faces not included). The front jaw features a solid steel dog in the front jaw which, when used in conjunction with a bench stop, allows oversized work to be held securely on the bench top. 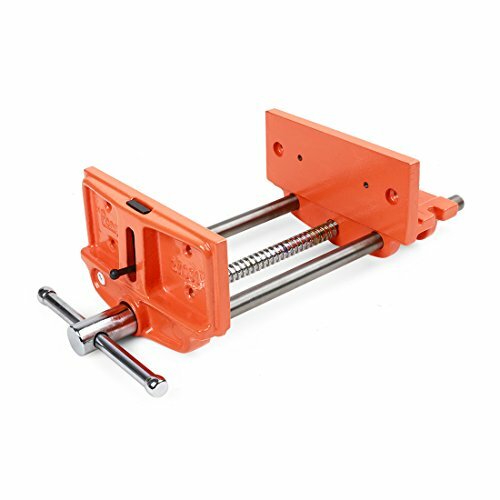 The vise operates smoothly with Acme thread main screw and twin guide bars of plated steel. Features a 7 inch jaw width and 9 inch maximum opening capacity. Castings are grey iron with orange baked enamel finish. The Chicago based Pony Tools Inc. (formerly known as Adjustable Clamp Co.) which was established in 1903 is the manufacturer of all Pony and Jorgensen products. The Pony Woodworker's Vises are imported from China.